I’m in the part of my sabbatical now where the board suggested taking some personal time, so this is a lengthy post about a visit to the home of my ancestors. In late April 1821 John Neilson and Arthur Lang, along with their spouses and four children each, joined with many others from their town of Paisley, Scotland and travelled a few miles to the port of Greenock to board the ship Earl of Buckinghamshire and begin their voyage to Canada. 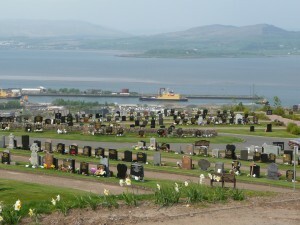 Greenock, Scotland. The port four of my ancestors left from in 1821 to come to Canada. Do you know who your ancestors are? Many people have a hard time going any further back than their grandparents. A great-uncle of mine started work on my mother’s family tree back about 1910 or so. He passed the info on to my uncle, who gave it to me when I was fifteen years old. I remember feeling amazed that I had so much more family than ever I knew. I felt like I had roots, a history, a context, that were all previously unknown. I have added extensively to what we know about my forebears. I also started work on my dad’s side, which no one had done. The best thing I did was to ask for memories before a generation was lost. I interviewed my grandmother, a great-aunt and others. I asked my dad to write his memoirs and my mom to fill out a “grandmother’s book.” I visited archives, libraries and museums to mine their treasures. If you haven’t documented your family’s stories and history, now is the time to start. As an encouragement to get going on your family history, let me tell you how I have experienced my own family background in a new way last week that could never have happened without someone recording it. Most of the branches of my mother’s family come from Scotland, and all of those are from either Paisley or Glasgow. 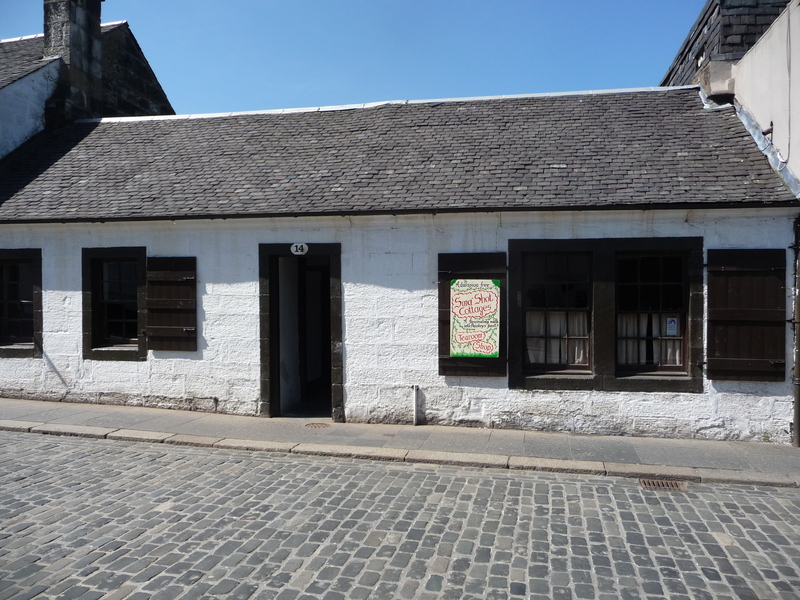 John Neilson and Arthur Lang were weavers in Paisley, the most important weaving centre in all Britain. (Think of the Paisley pattern and Paisley shawls.) But by 1815 or so, the cottage weaving industry that had thrived for hundreds of years was in serious decline. The new mechanized looms required a centralized workplace to take full advantage of their benefits, so factories replaced cottage workshops. Fewer and less skilled workers were needed. Cottage weavers saw their incomes drop by 80% in just two or three years. At the same time, the labour market was flooded with soldiers returning home from the Napoleonic wars, so Paisley’s weavers not only lost their work, but found it virtually impossible to find any work. The British government therefore encouraged emigration to the colonies and John and Arthur applied to the Paisley Townhead Emmigration Society to go to Canada. On September 28, 1820 their names were on the list submitted to the Earl of Bathurst for approval as being men of good repute suitable for settling overseas. This was a government program that was quite generous and no bad apples were to be sent. The men and their families were taught how to farm, they hired the ships, wrote the rules they would live by in crowded conditions on the six week voyage, and each brought a different book to contribute to a community library. I have a copy of Arthur’s day-by-day account of the voyage and a letter that John wrote to his family back in Scotland a few years later telling what it was like to settle in a virgin forest. There were not even any footpaths to guide them as they trekked through the woods to what is now Almonte, Ontario, just outside of Ottawa. The ship had some early excitement as it ran aground off of Ireland. The locals came to watch as the Earl of Buckinghamshire was battered against the rocks. Until an amount was paid to the Irish, no effort was made to free the ship! However, once paid, the ship was freed and off they went on their voyage, arriving in Quebec City mid-June. 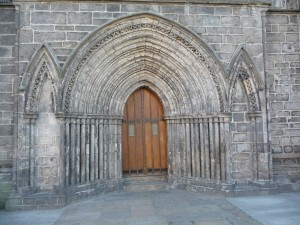 My time in the Paisley area was devoted to seeing things related to my ancestors. My most exciting find was a tombstone. How’s that for a highlight? Well, I was excited. Arthur’s father was also named Arthur, and he died of a stroke in the fall of 1821, just after his son emigrated. He was from Bonhill, not too far from Paisley, but at some point moved to Paisley. Tombstone referencing my 5th great-grandfather. 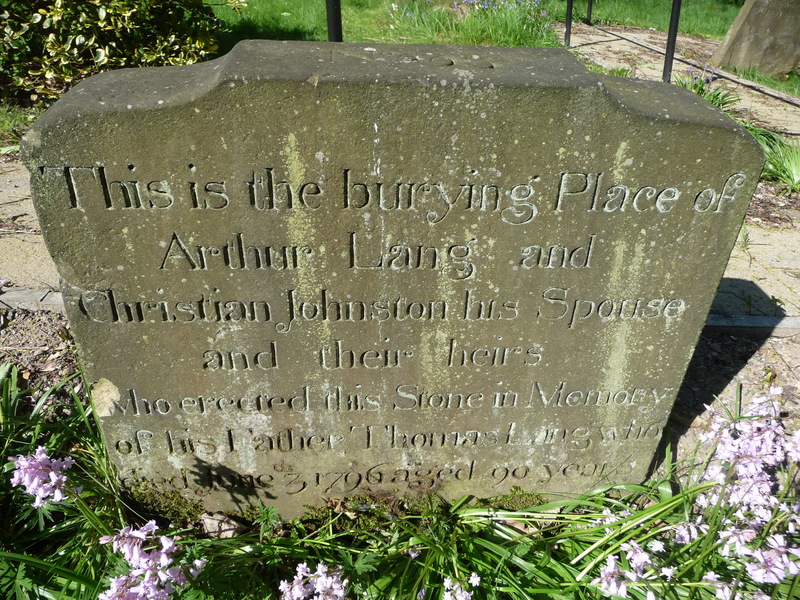 The grave is for Arthur and his wife, but it also has a memorial to this Arthur’s father, Thomas Lang, who died June 3rd, 1796 at the ripe old age of 90! Since the average lifespan in those days was likely fifty or so, Thomas was extraordinarily long-lived. The stone is very well preserved and it only took about fifteen minutes to clean the moss and grass out of the last line of text. The grave is in the churchyard of Castlehead Church. The church was built in the early 1780s and was called the West Relief Church. Its graveyard was originally intended for people whose lives were so sinful that they could not, with decency, be buried in consecrated ground. 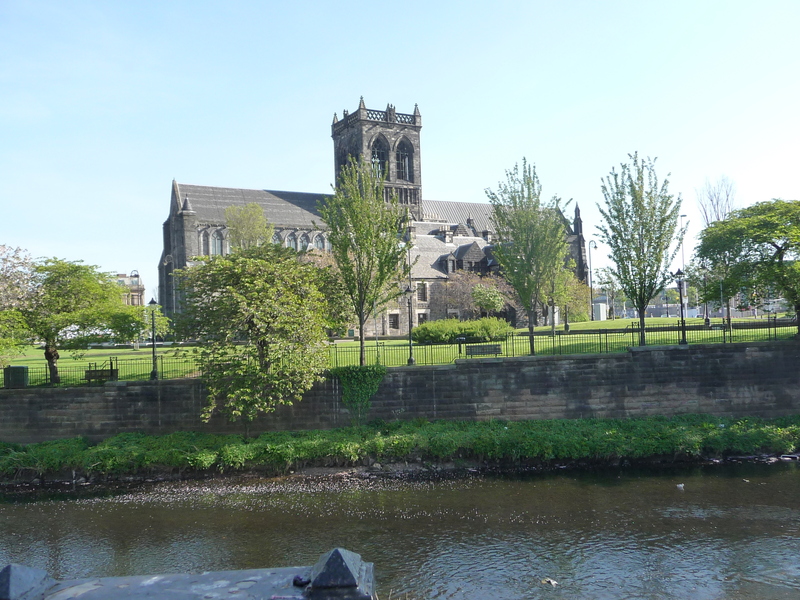 But within a few years, the area right around the church was developed into estate lots for the wealthiest citizens of Paisley. The subdivision was called Castlegate, the church was renamed Castlegate Church (Church of Scotland), and suddenly the graveyard was for acceptable people too. Robert Tannahill, the great Scottish poet, is buried only a few feet from the Langs. All of the other Langs and Neilsons were associated with the Abbey church or one of its satellites. Yes, they had satellite churches back then. The population in the Abbey parish grew to be so large that three churches were started. 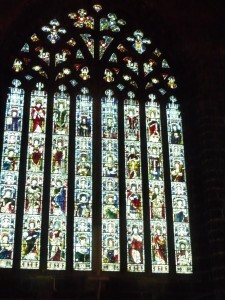 The Abbey church provided the ministers. Interestingly, the three churches were not put in diverse geographical locations. All of them are on New Street, not far from the abbey church, that runs up and down a hill that is fairly steep at the top end. These three churches were all built in the late 1700s and are called High, Middle and Low Church, depending on their relative elevations! 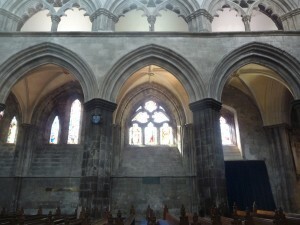 High and Middle Church are located just a few feet from each other. The walk is a minute or less between them. The walk to Lower Church is maybe five minutes. After 1790, my ancestors were members of the Middle and Low parishes, but neither of these churches still exist. 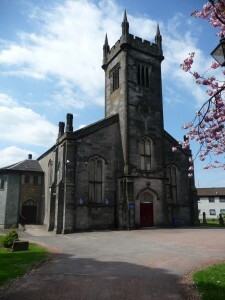 Middle Church is now an apartment building and Low Church is now the Paisley Arts Centre, a live theatre. I went to the museum, and saw an exhibit about the weaving industry. It had a map showing where all the weavers’ cottages were located. 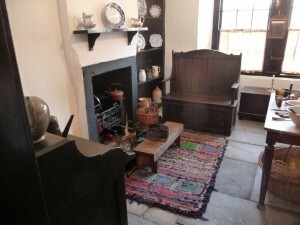 Next up was a visit to an original weaver’s cottage. There were still hundreds of these in the 1970s, but they were almost all purchased by developers, who tore them down and put up new buildings. A weaver’s cottage in Paisley, Scotland. The work room is on the left, and the one room living area is on the right. An original loom. This is for fine work, and a second loom in this room is for rugs. One man realized what was happening, and while there were still two or three left in 1981, he bought one that was in the oldest area and got some friends to help finance it. They shortly afterward bought another cottage on the next street that was probably inhabited by a foreman in a factory. They were able to connect the two backyards, started a charity, and sold the two properties to the charity for what they paid for them. The man who guided me seemed to tell the story as if he was reliving it, not reciting it, so I asked him if he was the one with the vision who made it happen, and he was. I thanked him for preserving Paisley’s history. 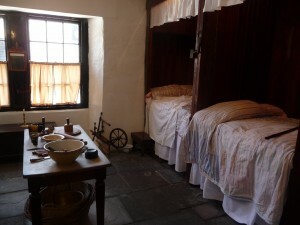 One half of the living quarters set up as it would have been in 1795. The rest of the room – the sleeping area. Both sets of my ancestors lived in cottages like these with four children (they were both young families and so didn’t have many kids at that point – they later had twelve and seventeen respectively). A weaver’s cottage is usually only one floor and has two rooms side by side separated by a hallway that goes from front to back. One room is the living quarters; kitchen, dining, sitting and sleeping. There would be two double beds against one wall, two trundle beds underneath and then, I suppose, cradles and mats. 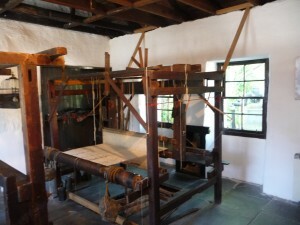 The other room housed the loom(s). The looms that were original to this cottage were found disassembled in the rafters. They are now back in their original condition and are used from time to time. One was for carpets and the other was for everything else, the finer material. I learned that weavers were avid readers and their favourite topic was politics. They loved to sit together and solve all the political issues of the day. Common wisdom in London was to watch what was happening in Paisley, because if revolution was ever going to come for real, it would start there. The weavers were well-educated for their time and for their place in the world, and they were considered radicals.They also loved to garden, but not vegetables or herbs. They loved beauty, so they grew flowers and developed several new types. 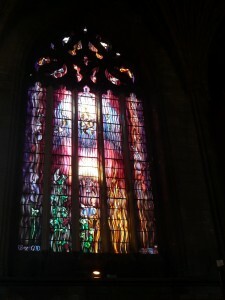 Abbey Church – the ancient portion. I like this door. It is the main entrance, but it isn’t used anymore. I checked out the Abbey church. 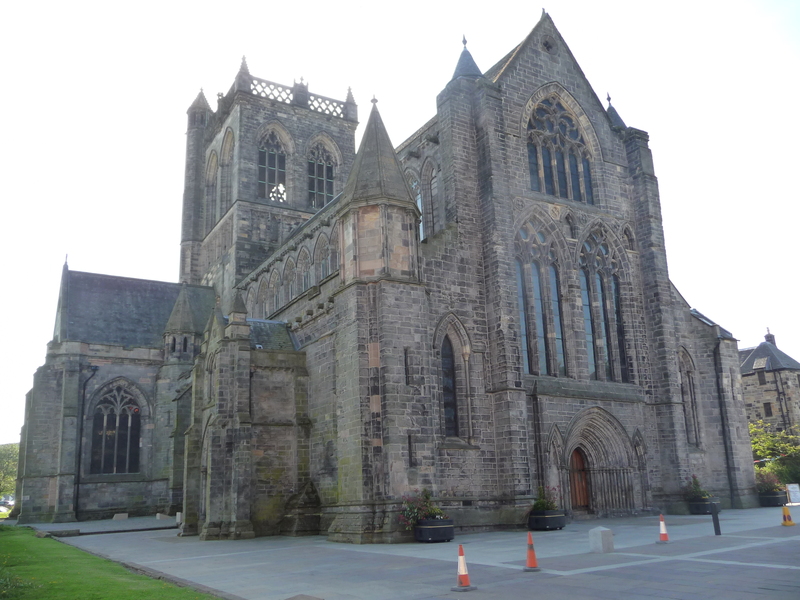 Paisley only exists because an abbey was built there. Cluniac monks were invited to set up a Priory in 1163, and the abbey church was built by 1173. The town then grew up around the abbey. In the Reformation and wars between England and Scotland the abbey was ruined except for the nave. 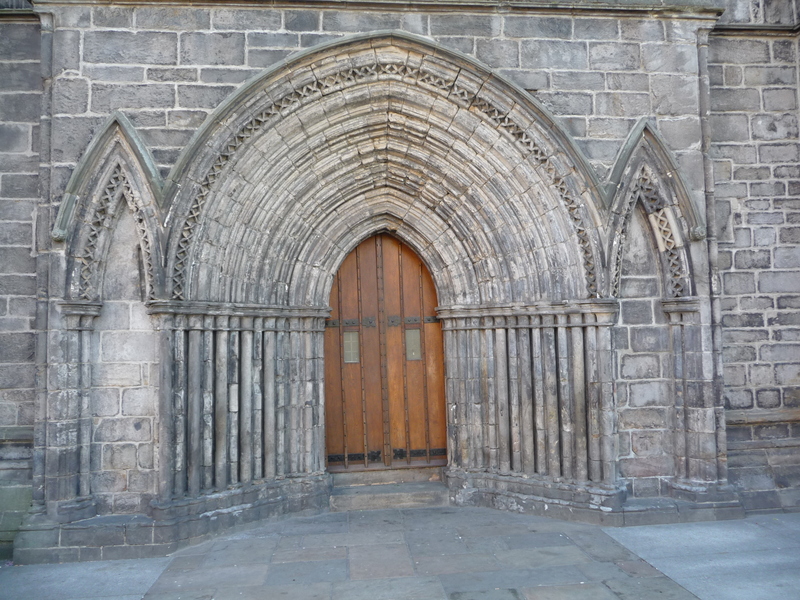 The monks were thrown out, it became a Church of Scotland parish, a new east wall was built so that the nave became the whole church, and so it remained until the late 1800s. 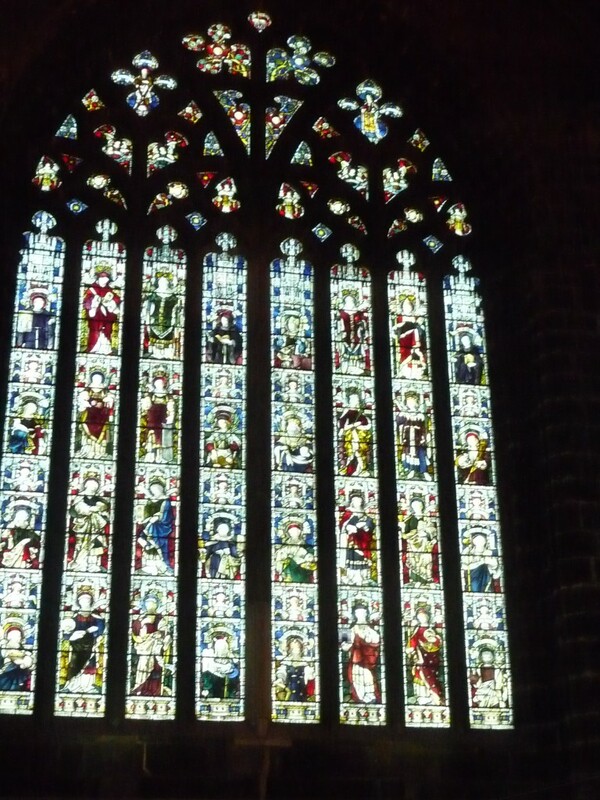 It was Queen Victoria, after a visit, who inspired the town to rebuild the rest of the church as we know it today. It is still known as the Abbey church and the Abbey parish. The old part of the church – the nave. Note the thick walls, large pillars and small windows. 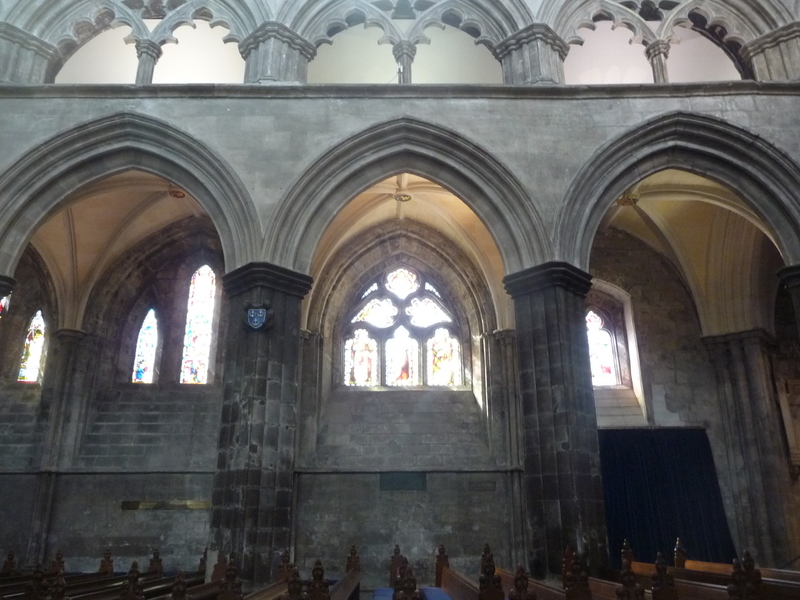 700 years ago, they did not know how to build thin walls with large windows and still support the structure. Compare the old part of the church to the chancel (completed in 1928). Here the windows are massive, the walls thin, and there is no need for pillars. 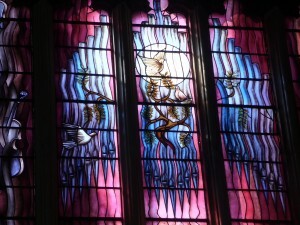 A beautiful modern stained glass window next to the organ case. 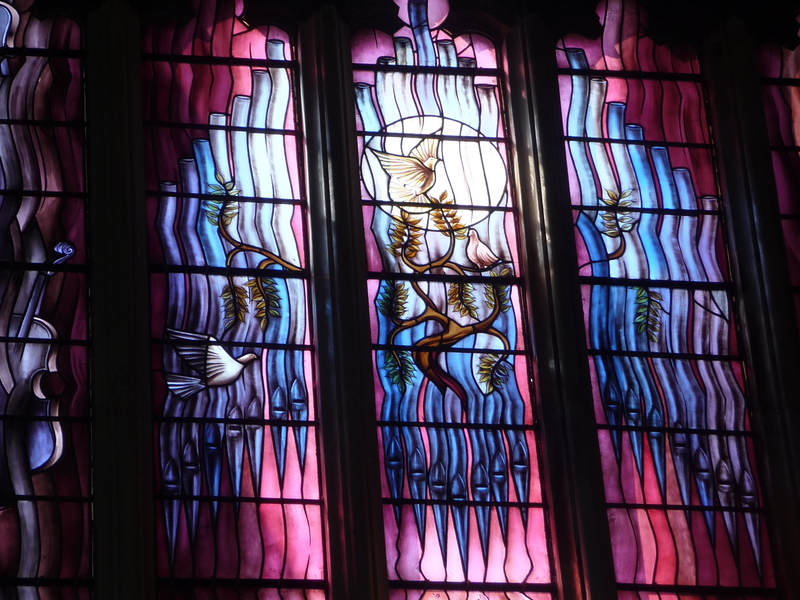 The upper blue part of the window portrays organ pipes and the Holy Spirit descending. Yes! Organ music is the music of God! Building new transepts, choir and altar doubled the length of the church and added what I think is quite an ethereal effect to it. 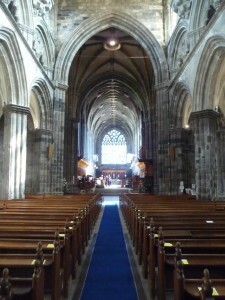 The nave was built in the 1300s, and so has a medieval look to it, seen in the stone work, columns and in the windows. The later addition was built between 1898 and 1928 and has a much finer look to it, with traceried windows, fine thin columns, massive windows and elaborate wood and stone carving. Sunlight floods the whole addition. The lighter colours and the effect of the sun beams make it seem as if there is a layer of gauze separating the nave from the chancel area. From the back of the nave, it feels like you are seeing a vision looking 500 years into the future. This picture doesn’t quite capture the gauze-like effect I saw, but it gives you the idea. While at the Abbey, I chatted with a man who ended up giving me some good background information. I discovered when I attended there on Sunday that he is the church’s verger. I did not know there is such a person, but I saw the same role at St. Paul’s. The verger is a layman who is in charge of keeping order in the service. He leads the procession and recession, and guides the minister to and from the pulpit. He carries a rod, called a virge, and the point originally was to use the rod to keep animals and people from disrupting the service. They are responsible for maintenance of the building and it’s assets, and overseeing the logistics of the services. After the service I had a good chat with the minister, who has served here for 23 years. I really think there is something to be said for long terms of pastoral leadership. Changing ministers every four or five years keeps people focused on the short term (what can I do before I move on?) so that the long haul work of building a church for a generation or two is less likely to happen. Long service pastors build deep relationships within the church and the community. The minister’s son moved to Canada and is youth minister at the Presbyterian church in Huntsville, ON. That is only a few miles from my family’s cottage. Strange how there can be such connections between people who have never met. The son first worked for a camp that is a CCCC member. The organist was away, so a very young man played today, and he opened with Buxtehude’s Prelude and Fugue in C, the second time I’ve heard it on this trip. After the service, when everyone was out of the sanctuary, he gave me a tonal tour of the organ. I was very surprised to discover it is a Cavaillé-Coll, as I didn’t know any existed outside of France. It is one of three that were built in the U.K., and he thinks the only one still in use. The stops have been added to over the years, but the voix humaine is original, so I had to hear it! I wanted to hear the excerpt from Franck’s Deuxieme Chorale, but didn’t want to put him on the spot. But without my asking, that’s what he played. I mean really, what else could he have played? That is just such a famous meditative showpiece for the stop. I had just played that very selection myself a few weeks before for one of my staff members, David Van Der Molen, who studied organ at college. 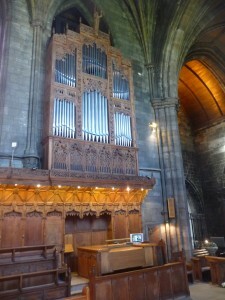 The organ is amazingly versatile because each division has a full principal chorus, often with two sets of foundations. The result is that it can sound English, Flemish, North German Baroque, French baroque and French Orchestral! One can’t help but feel a little envy. 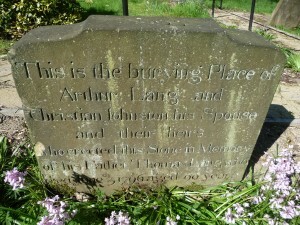 I went to see nearby Bonhill, where Arthur Lang’s father (the one whose grave I found) lived before moving to Paisley. There wasn’t anything to see there except a Church of Scotland church that I poked around a bit, but the building was closed. Loch Lomond, just down the road from Bonhill. John Neilson’s son John, and Arthur Lang’s daughter Mary, ended up marrying each other in 1838. Their grandson Morden (my grandfather) married Bessie Gentle. The Gentle family was from London, but her mother’s family, the MacDonalds, came from the Tollcross area of Glasgow. Charles MacDonald, a few generations earlier, came from Renfrew. 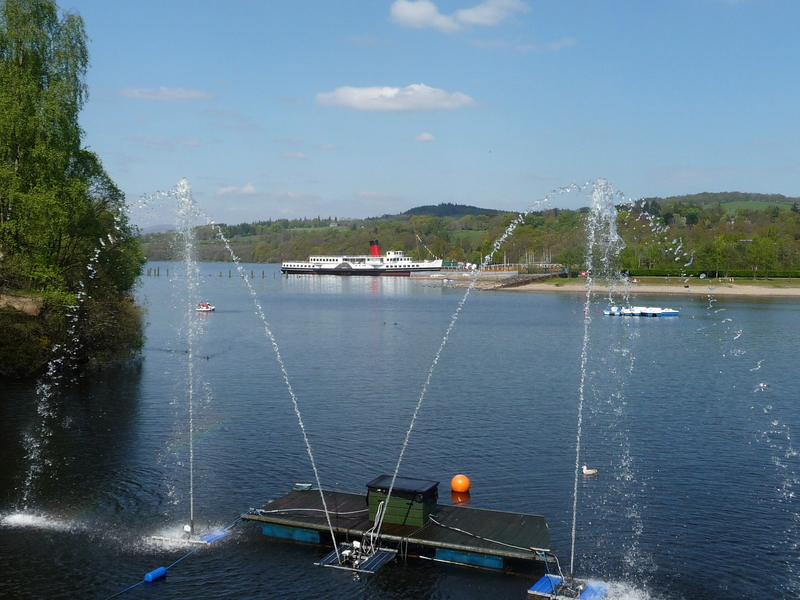 So I drove to Renfrew and Tollcross, but like Bonhill, there really was nothing to see. 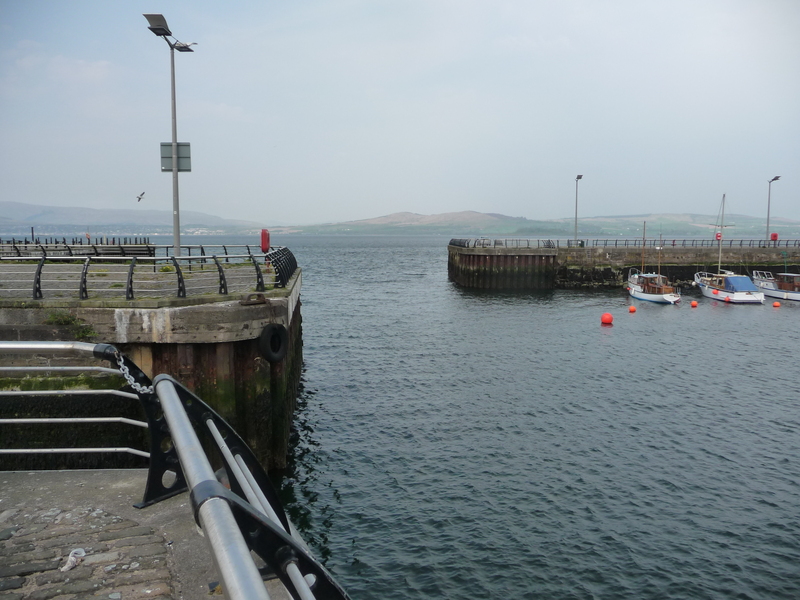 Finally, I drove to Greenock, looked at the docks from which the Earl of Buckinghamshire would have left, and then drove high up the hill to get a good overview of the area. 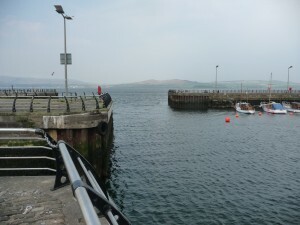 I wanted to see what my ancestors would have seen as their last view of their homeland, but there are no day cruises going in that direction (seaward), so I contented myself with a drive along the coast of the Firth of Clyde down to Largs. Just out of Greenock following the Firth of Clyde. 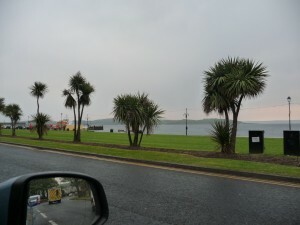 Who would have believed there’d be palm trees in Scotland!!!?? After taking pictures, I took the direct overland route back, which had a sharp turn that turned out to be at the top of a hill overlooking Paisley. They had a pullover there and it was quite a view. Visiting family sites in Scotland gave me a much better appreciation for the situation they came from. Even though there were tremendous pressures that left them not much choice about going or staying, I admire the gumption of these two men and their wives, in their very early thirties, to get up and leave everything and everyone they had ever known, and launch out into a new life in a part of a colony in which they would be the pioneers and, quite literally, the trailblazers. I have transcribed information for all members of the Paisley Townhead Society (this was the final list of those who actually did emmigrate), everyone who was on board the Earl of Buckingham (also called Earl of Buckinghamshire), and everyone who settled in Ramsay Township as part of the 1821 Scottish immigration. Both my ancestors (John NEILSON and Arthur LANG) were in the Paisley Townhead Emmigration Society, came on the Earl of Buckingham and settled in Ramsay Township. You can see the plan for the sleeping deck of the Earl of Buckingham. Thank you AJ. You should follow the link below to the Larnark Genealogical Society to see a database I created. It lists all members of the Paisley Townhead Society who actually emigrated in 1821 (some members did not), all passengers on the Earl of Buckingham and all settlers in Ramsay Township who were part of the 1821 Scottish immigration. The second link is to another list that someone else made that has only the members of the Paisley Townhead Society. By the way, I found a book about Scottish emmigration in the main library in London Ontario that had a very long fold-out page with a complete plan of the Earl of Buckingham showing all the berths that families slept in. It’s amazing what you can find in a library! The plan of the sleeping deck is online at http://www.theshipslist.com/pictures/earlofbuckinghamshire.htm. The ship was also sometimes called the Earl of Buckinghamshire. Well Mr. Pellowe, I was so enthralled by your story, I didn’t even connect the name. Your research is very well known and I feel very privileged to have had the opportunity to learn more about my family through your history heirloom. I had come across your database only a couple of weeks ago which fueled the engines to verify whether or not the William Lambie on your list is my ggg grandfather. I ordered the book “Scottish Settlers in North America” as I read it might have the names of the family members who travelled with William. Those family names alone are all I need as confirmation. I can hardly wait for the arrival of the book. Just think: our ancestors may have had one or two of those political banters for which they Paisley Scots are so famous! Unfortunately, I recently moved to a very touristy area which has little to no interest in genealogy, so there isn’t much available here. Thanks to generous people such as yourself; the internet has become my most valuable tool for digging up artifacts. I’ll let you know as soon as I find out something new. AJ, as I recall, there were a number of grandchildren of the settlers who moved to the United Staes from the families that came in 1821. If you haven’t done so already, the Mormons have the best genealogical records anywhere. There seems to be a lot of websites with free access to their records. Here’s one: http://www.ancestorhunt.com/mormon_church_records.htm. You can search Scotland, Canada and the U.S. there. All the best! I found your blog in a search of Earl of Buckinghamshire- my husbands ancestors are believed to have been on the ship in 1821. Lachlan McLean (mispelled on the shiplist) with his wife, 3 sons and 4 daughters. Your travels and descriptions are very informing and leave me wanting to learn more about the era. I feel I have to share this letter with you. It was written to my uncle, George Neilson, by his father Frank Neilson(my grandfather) in 1963. My mother was Evelyn Neilson (George’s sister). My great great great grandfather was John Neilson, a cottage weaver from Scotland, and may be the same John Neilson that you refer to, as he emigrated to Canada in 1821. If you need any further information about the resulting family line, feel free to contact me and I will supply what I can. While in Edmonton, I promised you I would write you a history of the family in Canada, as I know it, with particular reference to our line of descent and any side lines that occur to me. My great Grandfather, John Neilson came to Canada in 1821 or 142 years ago. Your line of descent is as follows: John the original Neilson in Canada, Mathew the youngest son of John my grandfather and the youngest son of John and the only one of the family born in Canada, George my father, who was the second son of Mathew, Frank your Father, the eldest son, and the first born of George and now you George in whom I depend with your brother John to carry on the family traditions. That tradition perhaps, is of a stiff necked people. Who while intolerant of anyone trying to force opinions, ideas, or a way of life on them have tried to deal justly and honestly with their fellow men. We all have some measure of meanness and dishonesty in our natures and while like Paul we have often done the things we would not, and left undone that which we would, most of our family have had a code of loyalty and personal integrity to which they have tried to live. Your own line of descent would be as follows. : George, the son of Frank, who was the son of George, who was the son of Mathew, who was the son of John, the founder of our line in Canada. Your great, great Grandfather John was a cottage weaver in Scotland. He was in that capacity an independent man,, who produced his own goods for sale. The advent of the power loom employing children at an early age, as well as adults, caused great distress among the cottage weavers who could not compete with the power loom and the low wages. The British Government accordingly offered to bonus any families that would emigrate to Canada. I suppose they used sailing ships in those days and it must have been quite an undertaking in those days to embark with a young family to the wilds of Ontario. Most of the information I give you about John Neilson is from my recollection of the contents of a letter he wrote to a Captain Somerville 20 years after or about 1841. Capt. Somerville lived in Florida. A copy of this letter had been handed the Almonte Gazette who printed it. I happened to be on my first trip back to Ont. from the West, I think it was the winter of 1911/12 and my sisters Elsie and Annie helped me copy it. I subsequently had copies typed in Westlock and at least some members of the family should have a copy. It was a very long letter about 20 written pages I believe telling about something of his experience in Canada. I don’t know what relationship there was between Somerville of Florida and the Neilsons of Ramsay Township in Lanark County, Ont. But when I was a child, Mattie Somerville and her sister whose name I do not remember, both school teachers, spent several summers holidays with Grandfather Neilson. So much for the Somervilles, some member of the family who sent the letter I refer to, to the publisher in the local paper, the Almonte Gazette. I of course never saw my great Grandfather and I imagine if Father knew him it was only as a child. In any event he rarely ever mentioned him and I feel did not know him. In my time as a child Father’s brother, and my uncle John lived on the original homestead. Grandfather resided on another farm on the 11th line of Ramsay township. The original homestead was on the 12th line. We lived on the crossroad connecting the two lines and our land connected with the original homestead. John Neilson made potash for which apparently was a market, by burning wood for the ash and on my frequent visits to play with my cousins, the place where he did his burning, evidence of which still existed, was often pointed our to me. I must say, it didn’t mean much to me then. When I was about 12 years old I was very friendly with an old man by the name of Tom Hamilton. He had known John Neilson. About all I remember of what he told me was that the old man relished a glass of whiskey on occasion. This may have been passed down. I never knew a complete teetotaler in the family, neither did I know of an alcoholic or a booze artist. There is quite a difference between having a drink and depending on a drink. My great Grandfather and his wife were buried on the homestead but their bones were afterwards exhumed and buried in the eighth line cemetry [sp.] where my Grandfather and my Father lie. 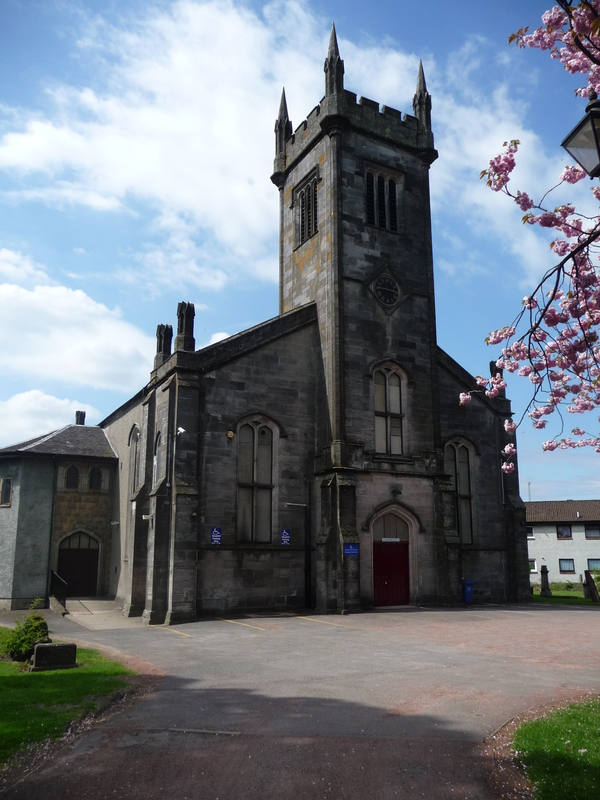 The Auld Kirk there has been restored. I have heard Grandmother Neilson mention walking eight miles to this kirk in her bare feet, then putting on her shoes just before she reached the kirk. Incidentally there was still a fence around the plot where my great Grandparents had been buried on the homestead or at least there was as I remember in my teens. Incidentally the 8th line cemetry, if you ever want to go there, is outside but quite near the Town of Almonte. Both my Father and Mother lie there as well as the older generations of our direct line. I was 9 years of age when Grandfather Neilson died. I do not remember a great deal about him, but it seems to me he was a very undemonstrative man. He wore a heavy and what might be called a spade beard . He was an elder in the Presbyterian church and in those days, a man had to be not only a God fearing man, but one with a spotless character in the community to attain such and honor from his fellow church members. So long as he lived, his word with his sons, was law. He suffered a great deal before he died and I can still hear him saying “oh dear, oh dear, oh dear” as he lay on his bed of suffering. I think that Mother gave him his greatest comfort at this time. She had a beautiful Singing voice as a young woman. He loved to hear her sing the old psalms and hymns and she spent hours doing just that as he lay on his bed of pain. None of his own children were singers, although Father had a true voice but in a limited range..
His funeral, which I well remember, as was the custom in those day, took place from the house. I can still hear and see the people as they sang the 23 rd psalm “ the Lord is my Shepherd I’ll not want, in pastures green He leadeth me. The quiet waters by”. They sang it with a simple faith that the Lord would provide a future home beside the still waters where there would be a respite from the heavy toil they had always known and all tears would be wiped away. I remember the long course of buggies that followed him to his last resting place, the 8th line cemetary. Grandfathers family consisted of John the eldest son, George, my Father and James the youngest. His daughters were, Annie “Mrs Turner”who was an early widow, Agnes [Mrs Thom], she died in Vancouver, Emmiline, a spinster and Jean [Mrs Woods]. she died in childbirth. Uncle John had 5 boys and two girls, George, William, Gordon, John and McFarlane., Maud who died in infancy and Laura who died from T.B. when she was 16. The members of other families were, Frank, Elsie, Annie, Merrill, Allan, Lillian. Elsie died Nov. 1962 and Lillian about 12 years ago. Both died of cancer. This seems all my hand will allow me to write today, the 19th. I felt off color yesterday so did not write. Now let me speak of my Father and I do so with love and respect. His memory remains with me green and tender over the years since his death. My first memory of him, I must have been awfully young, was running to meet him as he came from the barn. or less makes no difference. “Oh yes it does” replied Father “ no more and no less”. I have tried to live up that rule ever since. If I want to give a gift, that is different, it’s a gift, but I believe that in dealing with ones fellow man, the goods should be exactly as represented and one should take no advantage of the weak and foolish. Now I seem to have shot my bolt for today. 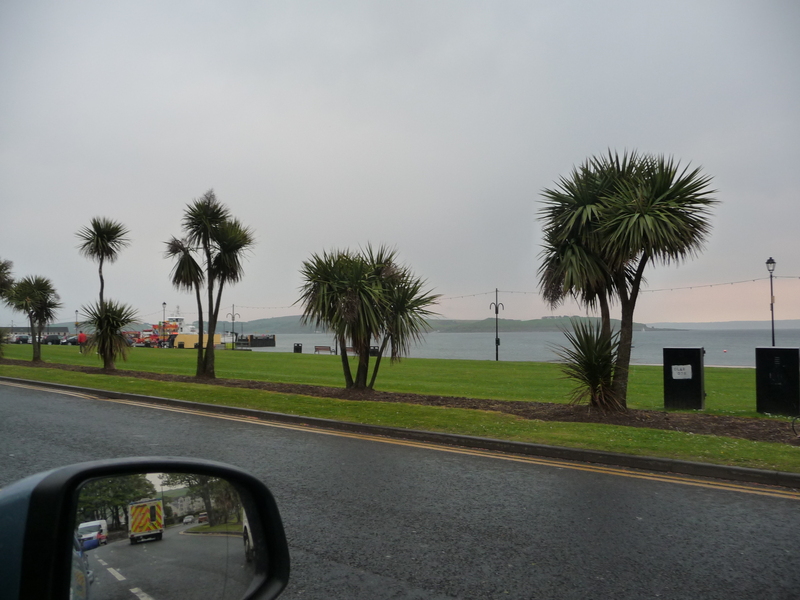 A dark and dismal day, no sign of the sun and raining. Now must return to Father. I occasionly dream of him. Meeting him and talking to him in my dreams is one of my most refreshing experiences. In may ways he was a humble man not however when anyone tried to interfere with his rights as a man and citizen. He never asked more than that and otherwise was wary of giving offence. He was a good man both in private and public. The Presbyterian Church of which he was a member asked him to be an Elder, to which he refused, feeling that he was unworthy. I mentioned before that he was a humble man but this shows he was held in high esteem by his fellow church members. For a time we gathered around the table every night at Fathers’ command, “Get the Bible”, and there we read verse about a chapter or two from the New Testament. In later years before I left home this had been reduced to Sunday nights. In Grandfather Neilsons house, on Sunday night, there was both Bible reading and family prayer. I am quite sure this was also the custom of my great Grandfather. As you know, I have read both the Bible and religious matters deeply but my reading has been both seeking and questioning, whereas they accepted the Word without question, or at least, I never heard them question any part of it..
Father was a pretty good carpenter. I don’t mean he was a tradesman, but he had flair for wood tools. He was also a very good man with a broad axe. When he was a young man he went to Pittsburg to learn the trade with a relative of Grandmother Neilson. Before starting him in the trade this relative as a welcoming gesture took Father to a whorehouse. Thus ended Fathers’ ambitions to be a carpenter. He left for Ontario the next day. This relative was not held in high esteem thereafter. Father, later come West. He hauled freight for the C.P.R. construction. They were then building around Calgary and west. His tails of the Bow River and of the Blackfeet Indians following the freight wagons are among my early memories, and I determined some day I would also go West. I think Father would have remained in the West but, Grandfather wanted to build what is known as a bank barn and wanted Fathers home. I understand he did a great deal of hard work on this project over the next two years getting out material etc. This barn was built in an L shape of log construction on a stone foundation about 6 feet high. Cattle were stalled in the foundation or underneath part and at harvest, grain was stored and threshed in the upper portion. house were 4 women and a girl to be clothed, none of whom had any special skill with a needle. They were Grandmother, Annie [Mrs. Turner] a young widow, Agnes, Emmeline and Jean. You can see a great deal of time would be required to outfit all these females. The upshot of it all was the Father and Mother were married. Uncle John before this was married and living on the original homestead, so Father and Mother lived for some time with Grandfather. I was born there. Fortunately it was a large stone house with five or six bedrooms. Later while I was quite young, a house was built on what was known as the Gemmel Farm. I imagine after building the bank barn, Grandfather needed some time to be financially in shape to tackle a new house. The sons paid their Father a nominal rent while Grandfather was alive for the land they occupied and lump sums were paid to the sisters and to Grandmother. Each paid in accordance with the value of the land they occupied. Mother was a tall and good looking woman with a very erect carriage. When she was a young woman she had a complection like a dusky rose. She worked very hard for us all. She was easily hurt and quick to take offence. From her forties she became more and more difficult to live with in many ways, the only thing I can liken it to is a light running horse hitched to a plow. In the last few years of his life she gave Father a rather bad time with what I can only call her shrewish ways toward him. She seemed to have a terrible urge to dominate. I remember her with love and with pity, pity for what she did to Father and herself. My son, these recollections of Father and Mother have been very painful to me as perhaps yours may be, if when you are 70, you write for your son some of your recollections of your Mother and me, when we too were young. There were so many intimate and previous memories. Now about some other branches of the family: William Neilson of ice cream fame. His Fathers name I believe was George, who was the eldest son of the original John Neilson. William Neilson was therefore a nephew of Grandfather Neilson and only about three years younger. Grandfather was 21 when he married and William was his best man. That branch of the family was musical and when I was a youngster, I remember William, on one of his yearly visits playing my violin after I had gone through the horrific scraping of a beginner which my proud and misguided parents insisted upon. The name is not a very common one and as you go through life it may be that you will meet those of common Canadian ancestry and this may help you to trace the relationship of any. I would hope too that your son may have the pride of name that helped me to keep reasonably decent in the face of many temptations that faced me as a young man in Alberta. In 1920, I had a hunch or an obsession that I must see Father. I was haunted by this idea, although I didn’t know why. I was thirty at the time but almost half of my life then had been spent away from the ancestral home. I couldn’t really afford the trip but finally the obsession became so strong that I borrowed the money from the bank and made the trip. I spent the next three weeks with Father, either working on the farm with him or spending the time with him. We were as it were, men together, but also Father and son with a better understanding of each other. To me this has been a previous memory. When it became time to leave, he drove me to Carlton Place where we shook hands as we parted. I never saw him again. He died in December. I have always been thankful for the hunch that drove me to the privilege of spending the time I was given to be with him. What more can I say? Now if there are any questions that may occur to you, ask them and I will try to answer. It is a lovely morning here, much different from the one on which I started this epistle. Now having run out of steam, I will bid you adieu. I trust things go well with and yours. Wow, what a great comment!! Thank you, Don. We are fourth cousins. You’ve added a lot of colour to the genealogical information that I have. Almost everyone you mentioned is in the family tree as I have it recorded, but I have your mother as “Unknown” as I knew there was another child, but not the name or gender, and therefore I don’t have you on the tree. The only corrections to your genealogical information are that the last five of John Neilson’s children were born in Canada, not just Matthew, and William’s father was John Neilson (not George), the oldest child of the John who emigrated to Canada. I am descended from William, who is my great-grandfather. I will connect with you offline about updating our respective family trees. Thanks again for your great contribution! It’s been quite a while since we last corresponded. Thank you so much for your ongoing efforts with the Neilson/Lang ancestors. A lot of great info on your blog. I will send you an updated gedcom with the updated information from the tree I’m working on. Since you and I last spoke, it’s grown quite a lot. I’m glad you found some help here, Avril. The Auld Kirk Cemetery is the most likely place of burial if he died in Almonte, but there are many cemeteries in the area. Also, some people are buried but have no stone. 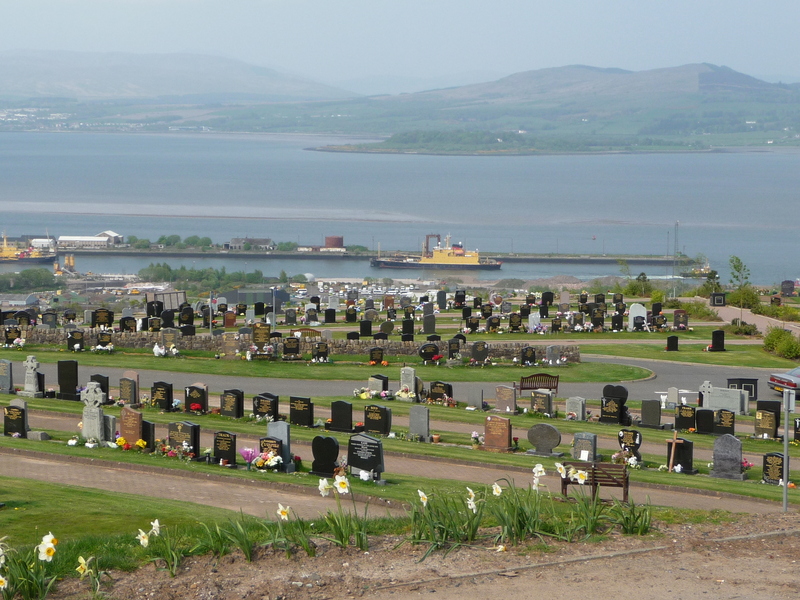 You might do better doing an online search for cemetery records. Hope you find what you are looking for. Hi Avril. I’m sorry but I have nothing much more I can say to help than what I said in my previous reply. I can only suggest that you check with the Mormon database, the most complete that I know of, for the birth record of the earliest ancestor you have that is a descendent of James MacFarlane. You should find the parents names on the record. The LDS database is available online. I think I have a link to it in one of my replies above. If not, Google it. Good luck! Hi, I going through your posting about going and checking where your ancestors came from in Paisley, Scotland. I noticed in the comments that there were 2 by Avril re her g.g.g. grandfather, James McFarlane and finding out more information about him. She will find more about him in the book by Carol Bennett, The Lanark Society Settlers published by Juniper Books in 1991. It should be available at globalgenealogy.com. There is quite a bit information on the McFarlane family.Avril, you can contact me if desired at johnandannatucker@gmailcom for further information. My g.g.grandparents, William and Hannah McEwan came on the George Canning settling in Ramsay township on the 6th concession. Thanks for helping Avril out, Anna. I hope she sees your reply. Helen, I am so glad you left another comment. The blog just moved this morning to a new website, and the comments were archived before you left your comment. So it was missing when the new site went live today. But here you are, writing again! Helen, thank you for writing. It means a lot to me that you, a native of Paisley, enjoyed the post. I brought my family to Paisley in July this summer and we all enjoyed our visit. I was sorry to see that the Castlehead church is now up for sale, with a possible use being conversion to residential units. I hope that the new owners respect the cemetery that comes with the property. I just researched “Paisley Buddies” and see it has an interesting history. Please regard me as a Paisley Buddy in spirit! Ran across your blog, Ancestral Roots in Paisley, quite by accident; although it came up as part of an occasional search I do for family history. My gg-grandfather, Alexander Hill, brought his family, to include his wife Elizabeth Currie and their seven children, to North America aboard the sailing ship Earl of Buckinghamshire. They were members of the Paisley Townhead Emigration Society sailing to Upper Canada in 1821. They originally settled in Lanark County, Ontario as members of the Lanark Society Settlers. Ultimately, between the years 1840 and 1842, the entire Hill family, parents, children and their spouses, had converted to the Church of Jesus Christ of Latter Day Saints (Mormons) and moved to Nauvoo, Illinois in the United States. Eventually, they all moved, with the Church, to Utah. My family is listed on the Passenger Lists you reference in the Lanark Genealogical Society database. Not sure where to go with this. Just seemed to be a good idea to post. Thanks for sharing, Daniel. It’s always interesting to hear someone’s story and see the flow of history through a family’s experiences. It seems quite a few of the families that came to Canada as part of that particular emmigration (there were two other ships that came with the Buckinghamsire) later moved out west in Canada and the United States, and also New York state. Glad my post has become part of your journey through family history! My great great great grandfather was James Bryson f- a weaver from Paisley who crossed with your families in 1821.They settled in Lanark, Ontario. their son George travelled to Fort Coulonge Quebec in 1835 at the age of 22 where he began a major lumbering business in the Pontiac. He also was one of three men to found the lumberman’s. Bank the Bank of Ottawa which expanded to the west coast and was purchased in 1919 by the Bank of Nova Scotia. He was chosen by Sir John A. To sit on the first Legislative Council of Quebec in 1867 and he remained until 1887 when his son George Junior took his place until his death in 1937- a total of 70 years!! I fortunately purchased his 1875 stone home in Fort Coulonge now called Spruceholme Inn and have built a restaurant called Bryson’s Bistro du Bucheron using the 1850 hay barn of George Bryson Sr.The stone church built across the street in 1890 is called St. Andrew’s Presbyterian Church and was built by the Bryson’s. In 2008 I wrote a book about the Bryson’s called The Bryson’s Blazing the Trail through the Pontiac as my father Eric Bryson Toller passed away and I wanted to dedicate the book to him. I have just returned from Glasgow where my daughter is studying for a year and. I plan to spend time in Paisley researching the Bryson’s in Scotland.I was excited to read everything that you have provided. Thank you to all for the great info – it has made researching my own ancestors (mentioned here by another comment – the Bryson family) significantly easier. I would like to ask permission to use a couple of your photos showing the old weaver cottages(s) for my own personal notes. You explain the feeling of the times very well. Yes, that would be fine. Please just give credit and the URL in your notes to the pictures. I have posted previously (September 29, 2013 at 11:27 PM) regarding ancestral travel from Greenock, Scotland to Upper Canada in 1821 aboard the the ship Earl of Buckinghamshire. Much family genealogy has been done and documented by others, so I am more interested in the histories and adventures of those who made the journeys from their homelands to the Americas. I’m curious to know if you might have a reference to the specific route the aforementioned sailing ship might have taken as it passed through the Irish sea, across the Atlantic and (more specifically) how it might have entered the Gulf of St. Lawrence and passed upriver, ultimately, to Lachine, Canada. Quite a request, I know, but I’ve not had much luck researching this particular detail. Thanking you in advance for any response, helpful or not. Hi Daniel. I don’t have any information of the exact route. I just assumed there would be one route from ‘here’ to ‘there.’ They likely followed a standard route. I’m sure there must be charts somewhere of the routes they would take for transatlantic crossings. All the best with your research! What an interesting post! I’m descended from Neilson’s from Paisely as well. I’m only 3 months into research on my family tree but was excited to come across this post! I found the info about the different parishes (high, middle, low) especially interesting since I have records for the branch I’m researching that go back and forth between them and wasn’t sure if that meant they were living in completely different areas of Paisley. Now I have better insight on this! I’m also wondering if all the Neilson’s in town were inter-related in some way or whether there were distinct unrelated lines, if you happen to know? Wondering if we’re distantly related!! Glad to be of help, Jennifer. Regarding your question, there were several Neilson families in Paisley and I have not researched enough to connect them. However, only one family came to Canada and that was John Neilson’s family, who settled near Almonte. The only other Neilson family in Canada came much earlier and settled in Quebec. I believe to this day all Neilsons in Canada come from one of these two families. You can use the contact button at the upper right if you would like to talk with me offline about how we both fit into the family. Wow! What an interesting blog. My family, surname “Lang” and “Colquhoun”, immigrated from Paisley to the U.S. in 1878, 1906 and 1910, settling for the most part in Central Falls RI, with one branch going on from there to Weymouth MA and another branch ultimately settling in Southern California. I have done a good bit of research, which makes your work fascinating to read. Interesting website. I’m following up on a Lang family from Paisley. So far I’m only back to James and Robina Craig Lang born about 1845. I have located two children Louis Burgstatler Lang b 1873 and James Lang jr b 21 January 1872 died 1926. He married in 1893 Janet McCullough who died age 93. Have death record would like to communicate with any relatives. They had six or seven children. Louis B Lang b 1903 and named after his uncle b 1873 died in Paisley on Glascow Road about 2000. He had one son, Norman Craig Lang who lives in Florida. He’s my neighbor. I came across your blog as I was accessing Earl of Buckinghamshire information. My ancestor, Daniel Currie, came aboard the ship in 1821 with over 600 others and settled north of the Village of Lanark in an area locally known as Lammermoor. They conveniently were all buried in the same cemetery, or their names were added to the stones when the Ontario government expanded Hwy 11 right over the old pioneer cemetery. I would commend the Lanark County Genealogical Society and the Lanark County Archives who have many books, deeds, wills, and newspaper articles from the early 1800’s to the present day. 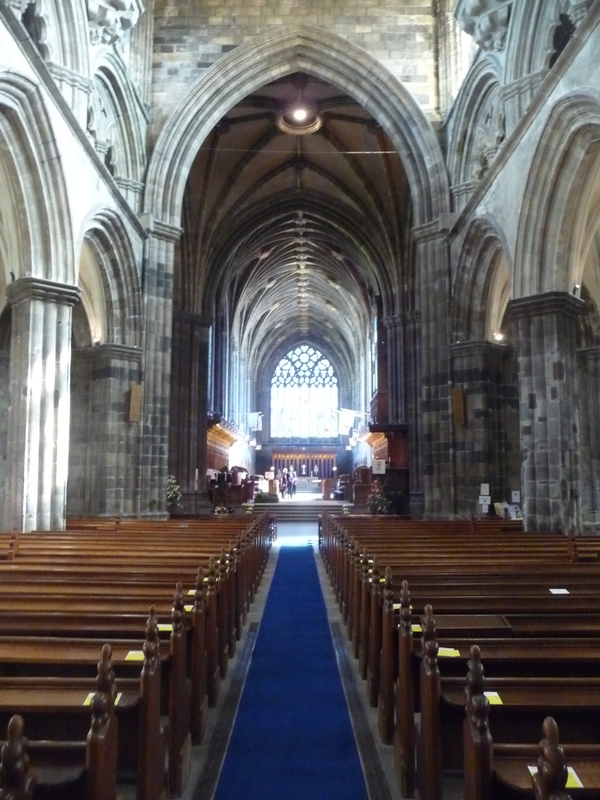 I went to the Glasgow and Paisley archives when I was in Scotland to do research and walked in Paisley Abbey where my ancestor was married in 1815, what a thrill. The small booklet by Lamond lists supplies on the ship, tools given to the settlers, an account of them going aground in the Irish Sea, etc. Our local library has a copy. Just an aside, did you know that a sailing of the Buckinghamshire, a year earlier, in 1820, carried a young, curly-haired boy and his parents; his name was John A. Macdonald. Keep up the good work. Thanks for your detailed comment, Sandra, which is quite helpful for other readers. Yes, I read a biography of Sir John A. and was quite excited to see the similarities of his emigration on the same ship. His subsequent life demonstrated, I thought, the difference in opportunities that arise from locating in a major city as opposed to an undeveloped rural location. Thanks for sharing your story. By email from CCCC News & Blogs (25 Oct 2018) I saw a comment to your blog on Ancestral roots in Paisley, Scotland by Sandra (Currie) Beacock dated 24 Oct 2018 wherein she acknowledged the emigration from Scotland aboard a ship in 1821 of a Daniel Currie. It appears that Sandra’s Daniel Currie may have been a sibling of the wife of my 2G-Gfather and for whom my great-grandfather might have been named (Daniel Currie Hill). He came to Upper Canada with his parents Alexander Hill and wife Elizabeth Currie Hill in 1821 aboard the Earl of Buckinghamshire. I’ve understood, maybe mistakenly, that a naming tradition among Scots was to give the name of every other son that of his grandfather, as was done in my family.